No, this is not some lame game played by 95 year-old retirees aboard a floating hotel! Human Shuffleboard is a fusion of the staid cruise ship game and bumper cars. Participants form two teams. each team has two shuffles. The shuffles are three foot round vehicles that roll on friction-less wheels. 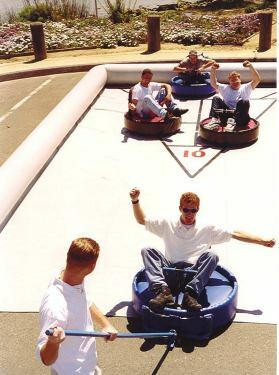 The board is a 39 x 15 inflatable arena. Shuffle riders hop into their disks and are ready to be propelled down the board by players using custom shuffle pushers. The excitement comes from being bumped off a score box or off the sides of the arena by an opposing teams shuffle!